The craft beer movement in North America hasn’t grown and thrived by producing beers that are subtle. Just like anything that exists outside the mainstream, craft brewing has always attracted enthusiasts looking for an experience beyond the usual—something with more character and flavor than mass-produced pale lagers. So for the last 20-plus years, there’s been a constant push toward bigger, bolder flavors and higher alcohol content. Meanwhile, the little guys—session beers, or low-alcohol brews that you can drink all afternoon without getting soused—have gotten lost in the shuffle. 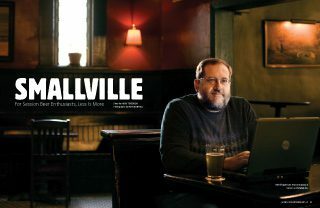 But since early 2007, one beer blogger, Philadelphia-based drinks writer Lew Bryson, who authors Seen Through a Glass (lewbryson.blogspot.com), has been a cheerleader for little beers. And what’s not to love about a beer that goes down easy, tastes great and won’t leave you stupefied—or your palate ravaged by excessive hops—after two pints? Long enjoyed in England as Milds or Bitters, these brews with less than 5 percent alcohol by volume (ABV) have seen a groundswell of interest, thanks in large part to Bryson and a series of blog posts he deemed the Session Beer Project. Bryson’s goal with the Session Beer Project, as detailed in his first missive in January 2007, was to “post notes on session beers at least four times a week, [including] tasting notes, style notes, food pairings, critiques, rants, praise, despair, news, whatever.” The SBP immediately caught the attention of New York Times writer Eric Asimov, a session beer fan himself, who wrote about Bryson’s endeavor on his own blog (thepour.blogs.nytimes.com). Since then, Bryson has posted about session beers from all over the world ranging from Milds and Brown Ales to Stouts and Pilsners, bringing attention to the fact that there are many options for those looking for a lower-alcohol, craft-brewed beer that is interesting and flavorful. Last May, he even helped organize a three-day tasting called the Session Summer of Love, which by his reckoning, is the first event dedicated to promoting session beers. Though he started brewing his Session Ales simply because he wanted to have a beer on hand that he could drink with his lunch each day, it turns out he may have unwittingly tapped into the growing session beer zeitgeist—they are, in fact, his best sellers during “Growler Hour” where three days a week he briefly opens the brewery to the public to purchase growlers (a half-gallon jug) full of whatever he has on hand. The trend toward increasingly high ABVs is a relatively new one that has paralleled movements in the food world. As people have sought out bold new flavors and taste experiences, craft brewers have stepped up and offered a plethora of beers with increasingly complex and challenging profiles. While these beers deliver more overall bang, they aren’t well-suited for a session. And therein lies the rub. Beer, for the most part, has always been enjoyed in a standard serving size: the pint glass. As alcohol levels have risen (some into double digits), it has meant that that same pint of beer is packing more of a wallop, and thirsty beer lovers have to choose between stopping after a couple or risking over-indulgence and palate fatigue. Session beers, by definition, are made for extended drinking sessions and are perfect for enjoying with friends at the local pub—perhaps their most appealing aspect. One need only look at the growing number of beers that are using “session” as part of their name to see that there is a growing interest in the trend. Boston’s Harpoon Brewing introduced its Brown Session Ale in early 2007 (see sidebar) and others, such as Oregon’s Full Sail with their Session Premium Lager, have followed suit. And brands that aren’t actively marketed as session beers—Alaskan Amber, Widmer Hefeweizen, Shiner Bock—but that have all the characteristics of a good session beer rank among the top 15 craft brands in dollar sales in U.S. supermarkets, according to statistics provided by the Brewers Association in their IRI Mid-Year 2007 Beer Review. Vodka made from cow’s milk? Don’t knock it till you try it.